Hi, I'm Martzipan and i'd like to join the community. I'm over 30 and i play the Arma 3 Exile and Battledield 3&4. I do play a lot on the ADK Chernarus exile server and i'd like to have a team that i can rely on. Hope we meet on the server. Hello and welcome to adk, I hope you enjoy your stay, I was wondering if your thinking about applying for adk as we have got an recruitment event on which all you need to do is apply, intro which u got and 5 posts and a vouch from staff then your in. 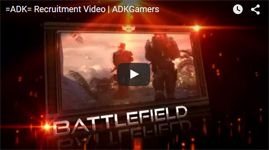 Welcome to ADK man, as my title says im of many BF admins in here, and we are always looking for more. Welcome Martzi I hope you enjoy your stay here and please if you are in need of anything please contact us. Hopefully I shall see you in teamspeak. Welcome to ADK, hope you've joined our Teamspeak server already! Yes I did, only shortly today though as i need to prepare for the weekend leave. But I have used it before with people I have met on the server. Hopefully I'll meet the ADK arma guys next week. Welcome to our forums @Martzipan ! What is your favorite thing about living in Romania? For the games you listed we do indeed have game servers for them! ARMA is a game we have had varying amounts of success in over the years, some times the section was great sometimes we had to shut it down. Right now we are blessed with an amazing set of Staff and Game Developers who work tirelessly to ensure that the playerbase is satisfied. Some of them are: @MrPig @CIT0RI @FakeDeath @James33 @Soap91 @Zudamour @AceOverKings @Gingergod5 . Welcome @Martzipan to the ADK forums. Everytime I see someone join us from somewhere outside the US I get happy because its great to know that we are consistently spreading our reach worldwide. We have many many members from the European Union as well as many others located around the world. Do you often play on our BF4 EU server? Hi all, Bunny here (if you listen in TS)... Raven Blacktail if you are looking for me in game. Hmmm... what to say about myself? I love housing! it is my favorite way to kill time in game. When I am not playing Wildstar I am taking care of my elderly parents, recording amazing audio (I am a voice actress), or out on a digsite (I am also a licensed Archaeologist. Welcome! Please come find me if you ever want to play some BF4 or if I can be of assistance with any other aspect of ADK. Hey @Nova, thanks for the welcome, it's great to be here! I started playing on the ADK exile server and that brought me here to the forums. I have played a lot of Battlefield but ever since i have found DayZ i started playing Arma 2/3 mods. I guess I'll have to find some time for BF as it was a lot of fun, and I think it will be even more fun with a team. @Gingergod5 sure thing. Is there however a place in the forum where all the people that play a specific game can sync? Hey, welcome to ADK! If you need any assistance you can find me in TS, just send me a poke and ill come to ya! Im glad youre here! If youre ever feeling like playing h1z1 or csgo im here too. @Martzipan welcome bud, hope to see you around! I mean like a post or posts where ppl make public their playing times so that other ppl that overlap playing times can get together. For example I play somewhere between 8pm - 1am GMT+2 on ADK's Exile Chernarus server and i would like to get in touch with other ADK members that do the same. @James33 thanks for the welcome. One question: do all ADK members wear the ADK tag on Exile? Great to see another Battlefield player. Are you excited for Battlefiled 1? I know i am! Ever want to wreck some peoples faces in Battlefield4 , you can find me on the ADK TDM server. Again, welcome to ADK and enjoy your stay!